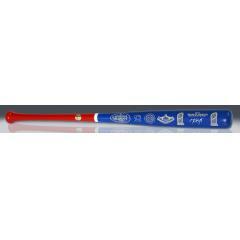 To celebrate the Cubs' 2016 World Series Championship, BigTimeBats.com is proud to release a limited number of special commemorative bats signed by the players who ended the franchise's 108 year drought. These two-tone bats signed by Bryant feature the Commissioner's Trophy, the Cubs logo and a silhouette of Wrigley Field. Kris Bryant signed each bat on the barrel. Bryant had a great post season to match his MVP-winning regular season, upon which he became the first player in history to win Minor League Player of the Year, NL Rookie of the Year and NL MVP in consecutive seasons. There is little doubt of his superstar status. These signed bats will be in stock by late June and will ship by the end of the month. Due to the limited availability of this item we must charge your credit card for the full price immediately upon taking your order. This policy ensures we reserve a Bryant signed bat for you. We will confirm your order by Email. This bat is not game used. Kris Bryant's signature comes authenticated by Fanatics. Kris Bryant Autographed Cubs 2016 World Series Champions Bat $695.00 Sold Out!